Since the Electro Breeze electronic air filters have low pressure drop and high efficiency, you benefit by installing the system with better health for you, your customers and your employees. Look at the typical application below to see how Electro Breeze can save you money and energy while giving you clean air to breathe! Click here to see why the Electro Breeze industrial air purifier should be on your list of Green Building Products. The Electro Breeze electronic air filters mean saving money and energy! 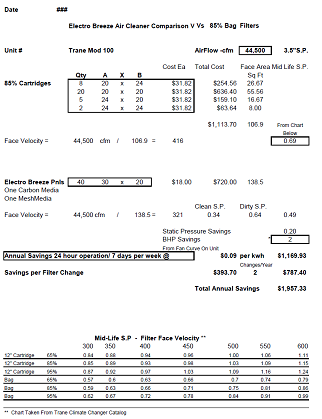 For a simpler way of looking at the cost savings of the Electro Breeze air cleaners, click here.